Academy of Natural Sciences, The - An international museum of natural history operating since 1812. Undertakes research and public education that focuses on the environment and its diverse species. African Bird Club - Birds, birding and conservation in Africa. Alaska Department of Fish and Game Surf Scoter Project - Sea ducks called surf scoters are an important subsistence resource. Since the Exxon Valdez oil spill, their numbers have declined. This website reports the findings of research into the life history and migration routes of these birds. The scoter update section tracks the travels of individual birds fitted with satellite transmitters. Alaska Wildlife Notebook Series - Descriptions of over 100 animals found in Alaska. All About Birds - From the Cornell Lab of Ornithology. American Museum of Natural History - One of the world's preeminent institutions for scientific research and education, with collections of more than 32 million specimens and artifacts. Also see Digital Special Collections. AmphibiaWeb - Access to taxonomic information for every recognized species of amphibian in the world. Species descriptions, life history information, conservation status, literature references, photos and range maps. Animal Diversity Web - Thousands of species accounts about individual animal species. These may include text, pictures of living animals, photographs and movies of specimens, and/or recordings of sounds. Descriptions of levels of organization above the species level, especially phyla, classes, and in some cases, orders and families. Hundreds of hyperlinked pages and images illustrate the traits and general biology of these groups. Ants of Costa Rica - Hymenoptera, Formicidae. AntWeb - Information and images on the ant faunas of California and Madagascar, and global coverage of all ant genera. ARKive - Centralised digital library of films, photographs and associated recordings of specie. A leading virtual conservation effort - finding, sorting, cataloguing and copying the key records of species, and building them into a comprehensive and enduring audio-visual record. Atlas of Living Australia - Contains information on all the known species in Australia aggregated from a wide range of data providers: museums, herbaria, community groups, government departments, individuals and universities. Audubon's Birds of America - The University of Pittsburgh is fortunate to own one of the rare, complete sets of John James Audubon's Birds of America. While Audubon was creating Birds of America, he was also working on a companion publication, namely, his Ornithological Biography. Both of these sets were acquired by William M. Darlington in the mid-nineteenth century and later donated to the library and both are now available online. Avibase - Database information system about all birds of the world, containing over 1.4 million records about 10,000 species and 22,000 subspecies of birds, including distribution information, taxonomy, synonyms in several languages and more. Barcode of Life - In 2003, Paul Hebert, researcher at the University of Guelph in Ontario, Canada, proposed DNA barcoding as a way to identify species. Barcoding uses a very short genetic sequence from a standard part of the genome the way a supermarket scanner distinguishes products using the black stripes of the Universal Product Code (UPC). Two items may look very similar to the untrained eye, but in both cases the barcodes are distinct. One of the most important components of the Barcode Initiative is the construction of a public reference library of species identifiers which could be used to assign unknown specimens to known species. Bear in Mind - Exhibit of more than 150 documents, photographs, publications, illustrations, artwork, and artifacts chronicling the extinction of the California grizzly bear. Presented by the Bancroft Library, University of California, Berkeley. Bee Culture - Magazine of American beekeeping. BeeHoo - World directory on beekeeping, bee management, hives products, hymenoptera, apitherapy and more. Bees - Apoid Wasps - From Discover Life. Haagen-Dazs Honey Bee Haven - An outdoor museum where visitors can observe and learn about bees and the plants that support them. Located next to the Harry H. Laidlaw Jr. Honey Bee Research Facility on Bee Biology Road, University of California, Davis. Sacramento Beekeeping Supplies - Information on honey, bees, and related products in Sacramento, California. Xerces Society - A nonprofit organization that protects wildlife through the conservation of invertebrates and their habitat. See its Pollinator Program. Biodiversity Heritage Library (BHL) - A consortium of natural history and botanical libraries that cooperate to digitize and make accessible the legacy literature of biodiversity held in their collections and to make that literature available for open access and responsible use as a part of a global 'biodiversity commons.' Search across books and journals, scientific names, authors and subjects. Search across books and journals, scientific names, authors and subjects. Bird Checklists of the United States - Current information on bird distribution in the U.S.
Bird Cinema - A video website for bird enthusiasts to watch and share original bird videos worldwide through the web. BIRDNET - information about ornithology, the scientific study of birds. This site is a service of the Ornithological Council, a public information organization involving ten North American professional ornithological societies. Birds, Bees and Blooms - A selection of natural history books from University of Glasgow, Special Collections. As well as often being groundbreaking scientific texts, many of these books are beautifully illustrated, charting advances in graphic art from manuscript illumination through to woodcutting, engraving and etching. Acclaimed as outstanding works of art today, these labours of love were often costly to produce: behind many of them are stories of struggles to find specimens and financial ruin brought on by high production costs. British Ornithhologists' Union (BOU) - One of the world's oldest and most respected ornithological organisations with an international membership stretching across all continents. Bug Bytes - Insect sound files: samples of sounds recorded from insect grubs, termites, and other subterraneanorganisms, and above-ground butterflies, moths, and mosquitoes. BugGuide - An online resource devoted to North American insects, spiders and their kin, offering identification, images, and information. Bulletin of Insectology - Publishes original articles mainly on morphology, biology, behaviour and physiology of insects and other arthropods; control of insects, mites and other arthropod pests with particular reference to biocontrol and integrated pest management. Butterflies and Moths of the World - Generic names and type-species. CalPhotos: Animals - Over 94,100 images of aniimals. California Academy of Sciences Diatom Collection - An ongoing project to present taxonomic information, images, records of collections, and references pertaining to diatoms. This work has been supported in part by grants from the National Science Foundation. California Department of Fish and Game - Manages California's diverse fish, wildlife, and plant resources, and the habitats upon which they depend, for their ecological values and for their use and enjoyment by the public. California's Wildlife - Biological information for each regularly-occurring amphibian, reptile, mammal and bird in California. Canadian Museum of Nature - 24 major science collections represent Botany, Vertebrates, Invertebrates and the Earth Sciences. Its holdings also include a Library containing more than 43 000 books and 100 000 volumes of periodicals. Commercial Fisheries - The Fisheries Statistics & Economics Division of the National Marine Fisheries Service (NMFS) has automated data summary programs that anyone can use to rapidly and easily summarize U.S. commercial fisheries landings. Domestic fishery landings are those fish and shellfish that are landed and sold in the 50 states by U.S. fishermen and do not include landings made in U.S. territories or by foreign fishermen. Conditioned Taste Aversion - A bibliography on taste aversion learning (in which animals learn to shun foods they associate with nausea) utilizing a variety of journal and on-line searches as well as preprints, reprints and pdf files from colleagues. Convention on International Trade in Endangered Species of Wild Fauna and Flora (CITES) - CITES is an international agreement between governments. Its aim is to ensure that international trade in specimens of wild animals and plants does not threaten their survival. Documents, species database, news and highlights, photo gallery, publications. Cornell Collection of Blaschka Invertebrate Models - Cornell University is one of a handful of academic institutions in the United States with a collection of glass invertebrates created by renowned 19th century glass artists Leopold and Rudolf Blaschka. All About Birds - Online guide to birds and bird watching. Bird Academy - Educational site for learning more about birds and biology. Handbook of Bird Biology, Third Edition - Textbook. Cryptozoology - Site dedicated to unknown animals - commonly called cryptids - which might possibly exist in nature but whose existence has not yet been accepted by modern science. Darwin Centre - Houses 22 million zoological specimens stored in alcohol. It is also home to nearly 100 scientists who are undertaking valuable research into the diversity of the natural world. Defenders of Wildlife - Dedicated to the protection of all native wild animals and plants in their natural communities. Electronic Zoo - Veterinary medicine and animal resources. eNature - A searchable database identifying more than 4,000 plant and animal species of North America. The species accounts are from the best-selling National Audubon Society Field Guides, Regional Guides, and Nature Guides. Encyclopaedia of Birdcare - Guidebook to the wild birds that visit your garden and how to care for them. Encylcopedia of Life (EOL) - Global access to knowledge about life on Earth. EOL brings together trusted information from resources across the world such as museums, learned societies, expert scientists, and others into one massive database and a single, easy-to-use online portal. Endangered Species Update - Published by the School of Natural Resources and Environment at the University of Michigan. A leading forum for information on scientific and political aspects of current threatened and endangered species protection efforts. Entomology - Like several of the other fields that are categorized within zoology, entomology is a taxon-based category; any form of scientific study in which there is a focus on insect related inquiries is, by definition, entomology. EuroTurtle - Sea turtle biology and conservation website. Florida Museum of Natural History Ichthyology Department - Educational sections about the biology, ecology and conservation of fishes and sharks. Photo gallery features the work of world-renowned underwater photographers. Host for International Shark Attack File (ISAF), International Union for the Conservation of Nature and Natural Resources (IUCN) Shark Specialist Group and the Southeastern Fishes Council. Friends of the Elephant Seal - Features background and images of elephant seals (sometimes called "E-seals"), and information about the Piedras Blancas elephant seal rookery and other marine mammals (such as California sea lions, harbor seals, sea otter, and whales). Includes links to related sites. Global Amphibian Assessment (GAA) - Comprehensive assessment of the conservation status of the world's 5,743 known species of frogs, toads, salamanders, and caecilians. Great Backyard Bird Count - Online citizen-science project collecting data on wild birds. Grizzly Times - A voice for imperiled grizzly bears and the wild ecosystems that sustain them in the American West. Guide to North American Bird Songs and Sounds - This guide will help you identify songs and sounds of North American birds. As you step through the guide, you will be asked whether the sound was simple or complex, musical or harsh, etc, a set of choices of sound attributes. For each choice, a list of birds whose sounds conform to this description is given. If you select one of these and click the Go button, you will see a pointer to a sound file of that bird, a text description of the sound you will hear, and a sonogram of the sound. Hawk Watch - Extensive information on hawks at eNature.com. HerpDigest - Electronic newsletter devoted to reptile and amphibian conservation and science. Hinterland Who's Who - The Hinterland Who's Who wildlife vignettes have been part of Canadian television and popular culture for nearly 40 years. This site provides the complete Who's Who series of 60-second educational vignettes. Also at this site, Who's Who fact sheets describing the appearance, life history, and habits of Canadian birds and mammals and wildlife-related topics such as bird feeding or endangered species. Horniman Museum - The Horniman has three main collections, Anthropology (Ethnography, 80,000 objects and Archaeology, 10,000 objects) comprising 90,000 objects and Natural History with 250,000 specimens. Horseshoe Crab - Natural history, anatomy, conservation and current research. Horseshoe Crab: History, Biology, Research and Conservation - Research-based information about the horseshoe crab (Limulus polyphemus), a major Mid-Atlantic resource. Ice Ages - Illinois State Museum exhibit providing information on glaciation in the Midwestern U.S. 16,000 Years Ago. Learn about some of the animals that inhabited of the midwestern U.S. during the last Ice Age. InfoNatura - A source for conservation information on the birds and mammals of Latin America and the Caribbean - more than 5,500 common, rare, and endangered species in 44 countries and territories. Insects - Insects on the web. This site aims to help you see insects for the miniature marvels they represent and to understand how intertwined our cultures have become with these creatures. Insects, Disease, and History - Devoted to understanding the impact that insects have had on world history, focusing on the influence of insect-borne disease on history. International Shark Attack File - A compilation of all known shark attacks that is administered by the the American Elasmobranch Society and the Florida Museum of Natural History. The American Elasmobranch Society is a professional organization comprised of international workers studying sharks, skates and rays. Invasive Species Initiative - The Nature Conservancy's national program for dealing with harmful invasive plant species on its preserves. ITIS Data Access (Integrated Taxonomic Information System) - The ITIS is the result of a partnership of federal agencies formed to satisfy their mutual needs for scientifically credible taxonomic information. The goal is to create an easily accessible database with reliable information on species names and their hierarchical classification. Jane Goodall Archive - Jane Goodall's meticulous note-taking grew into a rigorous long-term study of our closest living relatives, the chimpanzees. All of that data is now being curated and digitized at Duke University. Journal of Animal Ecology - Supports long-term ecological research in a changing world, and publishes the best original research on all the broad aspects of animal ecology. Marine Mammal Center - Rescue and humane treatment of ill, injured or orphaned marine mammals. Mites and Ticks - A virtual introduction to mites and ticks provided by the USDA. Smithsonian Institution, National Museum of Natural History - Washington, D.C. Also see Research and Collections and search the Museum Collection Records. Nature Conservancy, The: Birds - Learn about The Nature Conservancy programs experience and engagement with migratory birds; read State of the Birds report. Nature Video Archives - Watch video clips from the PBS Nature archives. Search by keyword or by program title. NetVet - A selected collection of veterinary medical Internet resources. North American Bear Center - Information on American bears and their role in the ecosystem. Nutty Birdcatcher - Provides information on birdwatching, backyard bird feeding, Eastern U.S. birds, comprehensive bird feeder preference chart, suet recipes, spring and fall bird migration timetables, maps of the North American flyways, the do's & dont's of building bird nestboxes, comprehensive guides to identifying birds with checklists. Ocean Animal Emergency - Part emergency room, part rehab facility, and part research lab, the Marine Mammal Center in Sausalito, California means the difference between life and death for sick and injured ocean animals. NOVA takes you inside this very special ER to witness the efforts of a renowned team of wildlife veterinarians as they fight to save their animal patients as well as to uncover the cause of a mysterious neurological illness plaguing marine mammals like California sea lions and harbor seal pups. One World Journeys - Collection of stories about the natural world. Ornithology - Information on wild birds, birdwatching, endangered and extinct birds. Otternet - Information on otters. Outdoor California - Official California Department of Fish and Game fish, wildlife and habitat magazine. Patuxent Wildlife Research Refuge - U.S. Fish and Wildlife Services wildlife experiment station and research refuge. Wildlife research and management includes waterfowl harvest management, wildlife habitat improvement, effects of environmental contaminants, endangered species conservation, migratory bird management, and wildlife population analysis. Primate Info Net (PIN) - A site for people with an interest in the field of primatology. PIN is maintained by the Wisconsin Regional Primate Research Center (WRPRC) Library at the University of Wisconsin-Madison. Protist Image Data (PID) - Provides pictures and short descriptions of selected protist genera, especially those genera whose species are frequently used as experimental organisms or are important in studies of organismal evolution and up-to-date information on the morphology, taxonomy and phylogenetic relationships of these organisms. 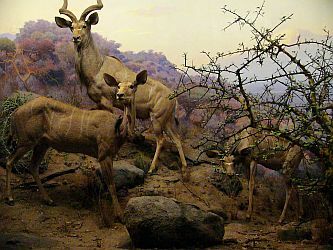 Red List of Threatened Species - IUCN (The The World Conservation Union), through its Species Survival Commission (SSC) has for four decades been assessing the conservation status of species, subspecies, varieties and even selected subpopulations on a global scale in order to highlight taxa threatened with extinction, and therefore promote their conservation. The taxa assessed for the IUCN Red List are the bearers of genetic diversity and the building blocks of ecosystems, and information on their conservation status and distribution provides the foundation for making informed decisions about preserving biodiversity at local to global levels. Seabirds and Forage Fish Research in Alaska - Information about seafaring birds. Search the Smithsonian Institute's Department of Entomology Collections - Directory of entomology databases: insects, beetles, butterflies, butterflys, bees, bugs, wasps, ants, flies, flys, dragonflies, dragonflys, damselflies, damselflys, coleoptera, lepidoptera, diptera, hymenoptera, heteroptera, homoptera, hemiptera, moths, orthoptera, entolmology news, taxonomy, systematics, scientific illustration, spiders. Singing Insects of North America - Enables users to identify crickets, katydids, and cicadas from America north of Mexico. The males of most species in these groups make loud, persistent calls that attract sexually ready, conspecific females. Traffic - Working to ensure that the trade in wild plants and animals is not a threat to the conservation of nature. U.S. Fish and Wildlife Service - Principal U.S. Federal agency responsible for conserving, protecting and enhancing fish, wildlife and plants and their habitats for the continuing benefit of the American people. Washington National Primate Research Center (WaNPRC) - Research conducted at the WaNPRC touches virtually every field of primate biology and medicine, there is particular focus on the neurobiological sciences, AIDS-related research, developmental biology, genomics, immunogenetics, primate models for human diseases, and psychological well-being needs of its primate colonies. Whale and Dolphin Conservation Society (WDCS) - Global voice for the protection of whales, dolphins and their environment. Wild Species: The General Status of Species in Canada - Provides overview of the status of Canada's species. WildFinder - Enables you to visualize global distribution of animal species based on WWF terrestial ecoregion maps. Wildlife of the San Francisco Bay Area (SFBayWildlife) - From the cool, blue depths of San Francisco Bay, to the sage-covered hills of Mount Diablo, the Bay area offers a multitude of species - mammals, birds, reptiles, amphibians, fish and insects. With detailed checklists for mammals, birds and other animals, identification resources and extensive guides to viewing locations, this site provides a unique, yet comprehensive portal to the world of Bay Area wildlife watching. Yahoo! Zoology - Directory of zoology resources. 21st Century Tiger - An initiative that raises funds for wild tiger conservation projects. Current members of the initiative are Dreamworld Wildlife Foundation and Zoological Society of London. Animals Asia - Devoted to the welfare of wild and urban animals in Asia. It's programs include: End Bear Farming, Cat and Dog Welfare and Action against Cruelty. Association of Zoos and Aquariums (AZA) - A network of more than 6,000 committed zoo and aquarium professionals, organizations, and suppliers world-wide. Berlin Zoological Garden - The oldest and best known zoo in Germany. Opened in 1844 it covers 34 hectares (84 acres) and is located in Berlin's Tiergarten. With more than 1,500 different species and around 17,500 animals the zoo presents the most comprehensive collection of species in the world. Also see Wikipedia entry. British and Irish Association of Zoos and Aquariums (BIAZA) - Professional organization representing the zoo and aquarium community in Britain and Ireland. A a conservation, education and scientific wildlife charity. Bronx Zoo - As the world's largest urban zoo, the Bronx Zoo features more than 600 species from around the globe. Meet some of its mammals, birds, reptiles, fish, and insects, and learn about their natural history, biology, cultural roles, and conservation status. Chester Zoo - One of the foremost zoos in Europe. In the sheer size and diversity of its collection, in the compelling innovation of its design, and in the breathtaking beauty of its gardens, it has had a profound influence upon the style and development of zoological gardens all around the world. Chester Zoo has eleven miles of tarmac pathways, and certainly demands more walking than any other British zoo, except perhaps Whipsnade. Columbus Zoo and Aquarium - Located in Powell, Ohio, , just north of Columbus. Home to over 9,000 animals representing over 700 species and sees over 2.3 million visitors annually. The animal exhibits are divided into regions of the world, with the zoo currently operating eight such regions. Dallas Zoo - A 106-acre (43 ha) zoo located 3 miles south of downtown Dallas, Texas. It's $32.5 million Giants of the Savanna Habitat is the first in North America, as well as one of the first on the planet, to combine a variety of large species in a single exhibit in order to re-create the landscape of the African savanna. See Wikipedia. Dartmoor Zoological Park (DZP) - A 30-acre zoological garden located near the village of Sparkwell, on the south-west edge of Dartmoor, in the county of Devon in the South West of England. See Wikipedia backgrounder. Set in 33 acres of beautiful woodland with stunning views of the surrounding countryside, DZP is a unique family owned zoo with a fantastic collection of animals, including tigers, lions, jaguar, linx and cheetah, bears, wolves, tapir, capybara, racoons, meerkats, monkeys, a fantastic collection of bugs and reptiles and more. Also see it's Keeper's Blog. European Association of Zoos and Aquaria (EAZA) - Represents and links 345 member institutions in 41 countries. Formed in 1992, EAZA's mission is to facilitate cooperation within the European zoo and aquarium community towards the goals of education, research and conservation. Good Zoo Guide Online - Provides official descriptions of every good zoo, wildlife park, and animal collection on the planet - as well as reviews and comments from visitors. National Zoological Gardens of South Africa - This 85-hectare Zoo in Pretoria houses 3117 specimens of 209 mammal species, 1358 specimens of 202 bird species, 3871 specimens of 190 fish species, 388 specimens of 4 invertebrate species, 309 specimens of 93 reptile species, and 44 specimens of 7 amphibian species. It is the largest zoo in the country and the only one with national status. Newquay Zoo Environmental Park - Cornwall's biggest zoo; proud to support overseas conservation programmes, helping conserve endangered species including red fronted macaws, pangolins and sloths. The Zoo also runs a highly successful breeding program. Omaha's Henry Doorly Zoo and Aquarium - Features: the largest cat complex in North America; Kingdoms of the Night, world's largest nocturnal exhibit and indoor swamp; Lied Jungle, one of the world's largest indoor rainforests, and Desert Dome, the world's largest indoor desert. See Wikipedia. Paignton Zoo - One of the UK's top zoos; also a conservation and education charity and part of a group of zoos and charities. San Diego Zoo Global - A conservation, education, and recreation organization dedicated to the reproduction, protection, and exhibition of animals, plants, and their habitats. Operates the San Diego Zoo. San Francisco Zoo - The San Francisco Zoo is located on the Great Highway between Skyline and Sloat Boulevards, next to the Pacific Ocean. Exhibit highlights include African Savanna (giraffe, zebra, kudu, horned oryx and African bird species), Grizzly Gulch (two female grizzly bears), Lipman Family Lemur Forest (four species of endangered lemur); Penguin Island (penguin colony of more than 50 birds). Additional exhibits include: the dramatic Jones Family Gorilla Preserve, Koala Crossing, Puente al Sur ("Bridge to the South"), the Lion House, the bear grottos, South American Tropical Forest, Australian WalkAbout, and Flamingo Lake. The Fisher Family Children's Zoo is home to the Family Farm, the meerkat and prairie dog exhibit, the Insect Zoo, and the Fisher-Price Littler Learners Cabin. In addition, the Koret Animal Resource Center, located adjacent to the Fisher Family Children's Zoo, is home to animals participating in the Zoo's outreach and education programs, including the summer Nature Trail program. Singapore Zoo - World-famous for its open concept, where animals are separated from visitors only by wet or dry moats. However, glass still protects visitors from the zoo's more carnivorous residents. Smithsonian National Zoological Park - Home, in Washington, D.C., to 2,000 individual animals of nearly 400 different species. Giant pandas, great apes, big cats, Asian elephants, birds, amphibians, reptiles, insects, aquatic animals, small mammals. You can take a virtual visit to the Zoo any day of the week by tuning into its live web cams, which feature many of the Zoo's animals. Taronga Conversation Society Australia - Works to promote animal conversation, including several breeding programs. Taronga Zoo, opened in 196, is the 52-acre city zoo of Sydney, Australia, featuring the largest group of native and exotic animals in New South Wales. Also see: Taronga Western Plains Zoo was the first open range zoo in Australia. Its animal collection has grown from 35 animals in 1977, when the Zoo first opened, to more than 1,000 animals from five different continents today. Tiergarten Schonbrunn - Part of the imperial summer residence of Schonbrunn, a UNESCO World Heritage Site, the world's oldest zoo is indeed an unforgettable experience, and one that no visitor to Vienna should miss. Along with the historic complexes of the former "menagerie" of Emperor Francis Stephen of Lorraine, visitors discover what is perhaps the world's most beautiful zoo in a unique setting where culture and nature blend. More than 500 animal species, some of them threatened, have found a home here and a chance for survival as a species. Whipsnade Zoo - A zoo and safari park located at Whipsnade, near Dunstable in Bedfordshire, England. UK's biggest zoo. Wildlife Reserves Singapore Conservation Fund (WRSCF) - Promotes co-operation between zoological institutions, aquariums, bird parks, conservation organisations, education institutions and government agencies with regards to nature conservation. World Association of Zoos and Aquariums (WAZA) - Members are leading zoos, aquariums, associations, affiliate organisations and corporate partners from around the world. World Land Trust - An international conservation charity, which protects the world's most biologically important and threatened habitats acre by acre. Zoological Society of London (ZSL) - An international scientific, conservation and educational charity whose key role is the conservation of animals and their habitats. The Society runs ZSL London Zoo and ZSL Whipsnade Zoo, carries out scientific research in the Institute of Zoology and is actively involved in more than 50 field conservation projects worldwide. Zoological Record - The world's oldest continuing database of animal biology. It is considered the world's leading taxonomic reference, and with coverage back to 1864, has long acted as the world's unofficial register of animal names. The broad scope of coverage ranges from biodiversity and the environment to taxonomy and veterinary sciences. This webpage last updated on Thursday, April 20, 2017 12:42 PM.